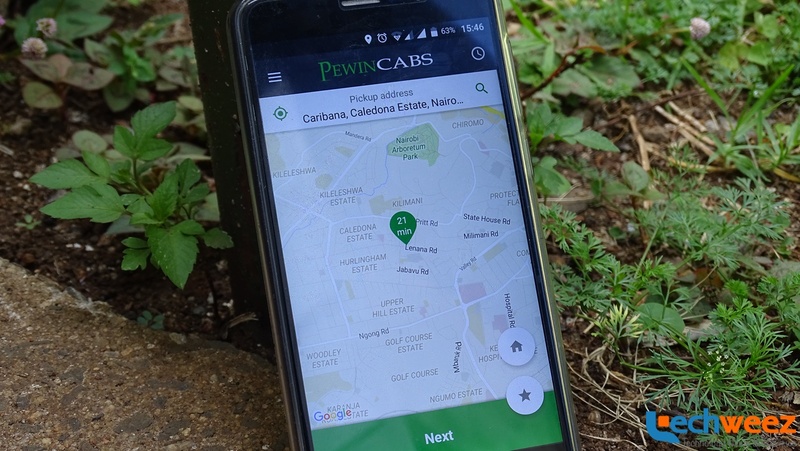 Pewin is a cab company started by a couple back in 2008 that has been pretty successful in the taxi industry. They have had an app for quite some time but according to Business Daily, many of their customers still book a taxi by calling them. But they do have an app, one that I can only assume has been improving over time and at the time of writing this article, the last update was made on 20th February 2016 which is very recent. It is very important to check when an app was last update, at least to give you some assurance that someone is still working on it! Details of the driver are sent to you via SMS with their details. You might be quick to say that this app is an Uber copycat, which is a warranted conclusion since they do look similar, but it would be wrong to just dismiss it as such. I say this for a couple of reasons. One, they have a different working model compared to Uber. Uber drivers are in a way independent. They get the requests for rides and choose to take it or not. Building on that, the choice of taking an Uber depends on you seeing an Uber close to your location on the map, hence why they are displayed. This is different from Pewin cabs. You do not see cars on the screen, all you see is how long it would take for a Pewin cab to get to you. Being that they are so few in number, you won’t “see” them on your screen as they have to be assigned to you. Your request doesn’t seem to go to the driver, instead, the central system. This is where you see a controlling factor. That’s the thing with this app, there is the feeling that there is someone behind a desk somewhere controlling all of this. There are texts that are sent to you about the driver, the car and your journey. It works exactly like the traditional way of calling the company and talking to an operator who assigns a taxi to you. It’s the same model. This is different from Uber as each individual driver is in charge. They are simply notified if someone near them is requesting for a ride and can decide whether to accept the request or not. These are two distinct apps and businesses models. Another thing I have noticed is that its design is well thought out. First off there are two types of accounts, either individual or corporate as most of their customers are corporate. Next, it has a map displayed, hence the comparison with Uber, which I don’t mind, that pinpoints your location and gives you an estimate of how long the nearest cab will take to get to you. The next step involves you choosing your drop off point. The first tab allows you to specify how you will communicate your destination, either by telling the driver, showing on a map or from someone from your contact list. There are also predefined destinations like airports, train stations, places and your favorites. I feel like these are well thought out choices that I can appreciate. Once that is chosen, you can choose the size of car you need depending on the number of passengers, when you need the cab, mode of payment, duration of trip and how much your fare will be. Once you choose accordingly, you can confirm your booking and get communication from Pewin about your booked trip. My overall sentiments of this app is that it’s nothing new. By that, I am not referring to the novelty of taxi apps like Uber, it’s obviously not new on that front but it is also not new in how people traditionally book for taxis from a taxi company. It’s the same underlying process as if I called or used the website to make the booking. My request doesn’t go straight to a taxi guy as it is on Uber, it goes to a control center who then find me the closest cab and tell them to come get me. This is okay as it is what people are used to. Guys in corporates will not hail an Uber if their company has an arrangement with taxis, it’s natural to book a cab via the company, and now by just using the app. It is a familiar experience, not one that requires users to learn something new. It is familiar experience. This is both a pro and a con. Being familiar means it is not something new, it is not a restructured concept which is where innovation happens. It is such a fantastic app, but little things like the icon can bug a stickler for design. Navigating the map can get a bit tricky in terms of usability. When on a map, you are used to taping on a location to pin it, but here, the pin seems stationery and you have to move the map to match it up. Confusing but you can get a hang of it after sometime. With all that aside, I have one general conclusion about this app, I simply love it. Its well designed and it is layered with features and options that have the customer in mind. It offers a wonderful user experience, with a few awkward gestures here and there (on map selection) but nothing to deter you away. It will be completely wrong to compare this with Uber as clearly its differences far outweigh its similarities. Rates are estimated on the app once you choose your destination. The article is about the app, not entirely the service as I mentioned that its not new, it is still the same method and even price as it would be if you called them or booked online. The article is about their new medium, the Android application. For someone who has not used their call or online service, that would have been valuable information. Thanks for that and noted. I did mention in the article that once a destination is chosen, you get to choose the size of car you want, the time you want it, duration of trip, choose mode of payment and how much your fare would be. I probably should have not bundled that in a sentence in order for that to come out clearer.